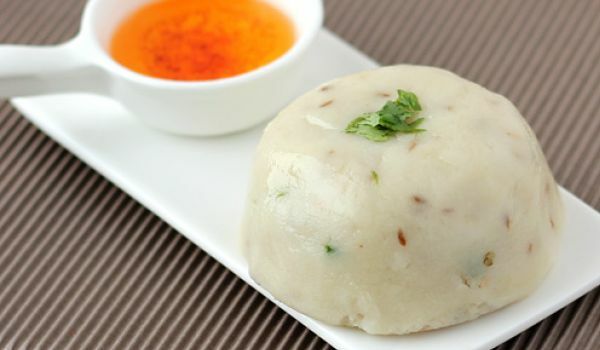 Rice Khichu is a popular Gujarati dish that is made with rice flour. This dish is an absolute treat to the palate and is the best snack for all you health freaks out there. Take a wide vessel (handi) and put 2 ½ cups of water in it. Put it over the flame and bring it to boil. Now add chilli powder, cumin seeds, soda-bi-carb, green chillies, salt and a pinch of hing into it. Mix well and let it boil for few minutes. Now slowly add rice flour and keep stirring so that no lumps are formed. Cover the vessel with a lid and cook for 10 more minutes. Now put oil and coriander and mix it properly. Serve hot Rice Khichu with papad.